Last week, I had the pleasure and honor of attending and speaking at the 2018 Global Climate Action Summit (GCAS). GCAS brought over 5000 global thought leaders, nations, cities, and companies together in San Francisco. Thousands more followed the live stream of the event worldwide. GCAS intended to celebrate the extraordinary achievements of organizations with respect to climate action, as well as make deeper commitments to take further action against climate change globally. In addition to the 300+ media outlets present, the full list of delegates included many high-level representatives of multinational companies, countries, and cities worldwide, such as Al Gore (Former US Vice President), Michael Bloomberg (CEO Bloomberg L.P.), John Kerry (Former Secretary of State), Paul Polman (CEO Unilever), Anne Hidalgo (Mayor of Paris), Kevin Johnson (CEO Starbucks), Jesper Brodin (CEO IKEA), Ahmed Aboutaleb (Mayor of Rotterdam), and many more. I must say that it was exciting and inspiring to be there—to see so many states, cities, businesses, and investors leading the charge to reach net zero emissions by the mid-21st century. I was personally moved by the fact that EVBox was able to be a part of this community that is trying to solve the problem of climate change and working to make the earth a better and safer place. Listening to so many inspiring stories leads me to share my three biggest insights on the role of leaders, cities, companies, and individuals in the global fight against climate change. As many of you have read online, GCAS was full of announcements. Yet, there wasn’t a single announcement by a country at this summit. Most announcements related to nation-wide cuts on emissions came from cities and states. California alone made incredible progress by passing a bill to use 100 percent emission-free electricity by 2045. Jerry Brown, the Governor of California, announced an even more ambitious (if less binding) executive order that commits the state to carbon neutrality over the same timeframe. 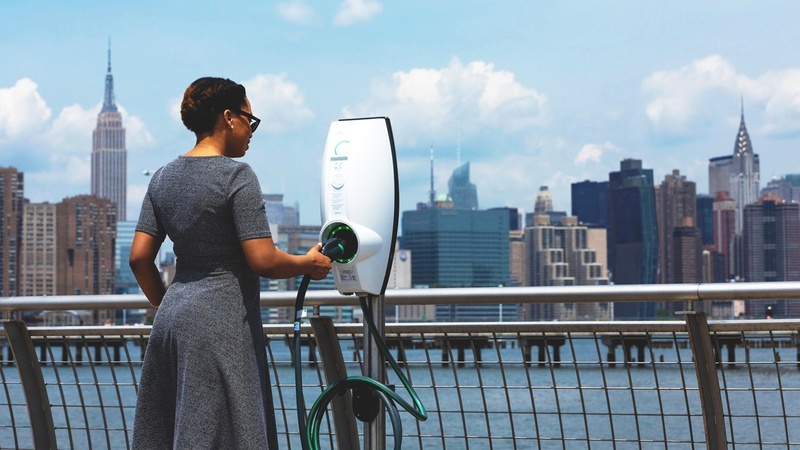 26 cities and states, including Tokyo, Seoul and Rotterdam, committed to 100 percent zero emission vehicle targets starting with the establishment of zero emission city zones. With a combined population of 140 million, these 26 cities and states are setting an ambitious bar for others across the globe to follow. Further to the above announcements, I was overwhelmingly happy to see that 27 cities have peaked in emissions. These cities have seen their emissions fall over the last five years to at least 10 percent below peak levels, while their economies and populations have continued to grow. A big shout out to Barcelona, Basel, Berlin, Boston, Chicago, Copenhagen, Heidelberg, London, Los Angeles, Madrid, Melbourne, Milan, Montréal, New Orleans, New York City, Oslo, Paris, Philadelphia, Portland, Rome, San Francisco, Stockholm, Sydney, Toronto, Vancouver, Warsaw, and Washington (DC) for achieving this momentous feat. These cities together represent 54 million urban citizens and a combined GDP of $6 trillion. Furthermore, incredible promises were made by cities that are dramatically affected by the poor air quality and CO2 emissions caused by the transport industry and beyond. Businesses MUST include sustainability as a pillar of their strategy, and there are more role models than one thinks. 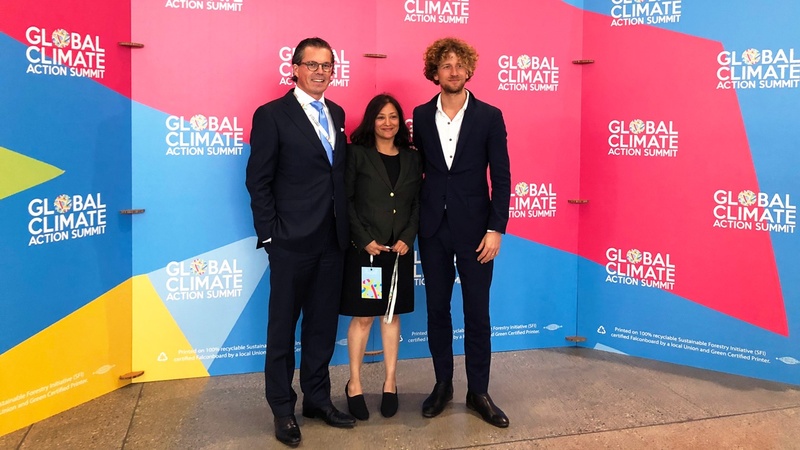 One of the many questions raised prior to the start of the GCAS was the role of businesses and how active they should be in pushing sustainability and ensuring that carbon neutral practices are put in place in order to achieve a low carbon and circular economy. It was impressive to see the World Green Building Council launching the Net Zero Carbon Buildings Commitment, which entails that all new buildings they operate, own, or build will produce zero carbon and be EV-ready by 2030. The Net Zero Carbon Buildings Commitment clearly sets a standard for the type of buildings we should strive for, and I personally see that difference every day that EVBox works in one of the most sustainable buildings in Europe. India’s $20.7 billion company Mahindra Group is going carbon neutral, and strict, independently-verified carbon limits were embraced by 76 companies, including Adobe and Dell. IKEA Group is seeking 100% zero emissions by 2020 for "last mile home delivery" in Amsterdam, Los Angeles, New York, Paris, and Shanghai. Salesforce, which led the creation of the Step Up Declaration, is committed to achieving 100% renewable energy by 2022. The company will also work with its top suppliers to set their own emission reduction targets by 2025. Following Salesforce's example, 150 other companies, including giants such as Sony, McKinsey Group, WeWork, and the Royal Bank of Scotland, are committed to sourcing 100% of their electricity from renewable providers in the years to come. Starbucks announced 10,000 "greener stores” by 2025 and that they will be co-developing the framework of these stores with help from the World Wildlife Fund (WWF). The coffee king says that “greener stores” will save $50 million on utility costs over the next decade. These are just some examples of companies making a difference and placing sustainability as a pillar of their business model. It’s an exciting time to be part of the electric mobility movement. It took 60 months for the first million EVs to be sold. It then took 17 months to go from 1 million to 2 million and only 10 months to get from 2 million to 3 million. We’re predicted to arrive at the 5 million mark about 6 months from now. At the current rate of growth, it’s forecasted that more than 30 million EVs will be on the road by 2025. We are truly about to reach the tipping point. This is why EVBox was proud to announce our commitment to place at least 1 million EV charging stations, both regular and fast charging, by 2025, helping reduce CO2 emissions and improve air quality. I personally believe we can get there sooner, and that we will go above and beyond this number. 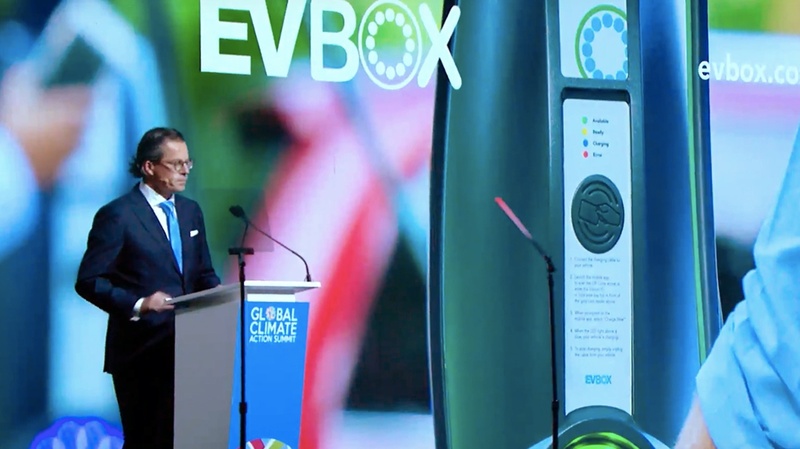 As CEO of EVBox, I was proud to make this commitment alongside the others that we heard from at GCAS last week. We were all brought here for a single reason—to create and sustain the momentum of the electric mobility movement. Currently, there are approximately 500,000 public chargers in the US, Europe, and China. The 3.5m new charging stations announced at GCAS by EVBox and ChargePoint (and though we are competitors, I am happy to see both companies committing to something bigger than ourselves, making us the only two global players to stand up), and the commitment of other states to public charging infrastructure, will support the forecasted 30+ million EVs that will be on the road globally by 2025, driving a combined 618 billion electric kilometers per year. Together we can electrify the world, drive zero emission mobility, and create a safer and healthier future for everyone! There’s a lot to say about momentum, starting with its law—“An object in motion will stay in motion.” We are in motion, and together, we will pave a path to sustainable mobility and a zero-emission world.